Meanwhile heat oil in large skillet. Add broccoli; cook stirring constantly about 5 minutes or until crisp tender. Add garlic and cook for 1 minute. Remove from heat; stir in walnuts, soy sauce, and crushed red pepper. 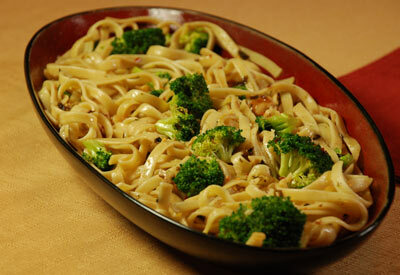 Toss hot pasta with walnut sauce.